Toasting on trips is easy! This is the wine tote that really packs it in. Carry up to 6 bottles of wine or champagne wherever you go. Keep bottles cool with included chiller pack. There's also a two-way lock ready zipper, carry handles and an adjustable shoulder strap. Toasting on trips is easy! This is the wine tote that really packs it in. Carry up to 6 bottles of wine or champagne wherever you go. Keep bottles cool with included chiller pack. There's also a two-way lock ready zipper, carry handles and an adjustable shoulder strap. Insulated durable black nylon. Six adjustable bottle pouches. Ice pack included. Holds up to 6 standard size wine bottles. Can hold up to 3 magnum size bottles with 3 standard size bottles. Wine Bag can not hold more than 3 magnum size bottles at one time. The Weekend Wine Bag works great for hauling Bloody Mary essentials, too. But, it would be perfect if there was a small insertable ice chest available for it....Is there such a thing? BEST ANSWER: Yes you do receive one chiller pack with your purchase of the bag. And the bag is great and you can add to that if you want to . The inside space can be used creatively. There is an insertable freezer pack. It works pretty well. I don't know. I personally never heard of it. is this safe to check on an airplane? BEST ANSWER: Thank you for your inquiry. As carry on luggage, this would not be allowed. For checked baggage, be sure to pack extremely well in your luggage. If you have any further questions feel free to reach out to us at 800 356 8466. Thank you again. The Weekend Wine Bag says it is good for day trips, so I would say no, due to the airlines do not allow liquid on planes. You should contact the airline that you wish to travel and see what their policy is. Are the inserts removable? Can this be collapsed to pack into a suitcase? If so, what is approximate depth when collapsed? The insides can be removed and this can be folded flat to be packed . It would be 3 " to 4 " thick. If you use ice to cool does the exterior remain dry? BEST ANSWER: The bag was a gift so this is just an observation - it is stitched heavy fabric so I would not assume it is water tight. I suggest you use ice packs, not ice. It is designed to transport wine, not chill it. The family member who received it uses it frequently but only for transporting wine; it is insulated so it should hold temps long enough to transport. Recommend to use sealed chiller/ice packs. Comes with one. Would this bag work for carrying liquor bottles as well? BEST ANSWER: depends on the size of the liquor bottle as this wine bag is 12" tall. Champagne is taller(15") and since it's nylon, it does have some give to it. BEST ANSWER: Thank you for your question, the size is about 2" larger and is made of the same Neoprene materials. We actually own six of the Weekend Wine Bags. When we got them, each came with three "chiller packs." However, over time every one of the chiller packs has leaked, so we've had to throw them all away. Does anyone who still has the chiller packs know what brand they are? I'd like to get more, because they worked great! Great bag, prefect for trips. The only draw back is the freezer pack is small, I use a different one that I purchased since I prefer cold white wine. It will also hold your glasses but, it cuts down on the amount of wine you can pack. The bag is well thought out and does what it says. For the money though it does feel a little cheap to me. The materials don't feel solid. I think it will hold up over the long haul no problem just would like to see nicer materials used. 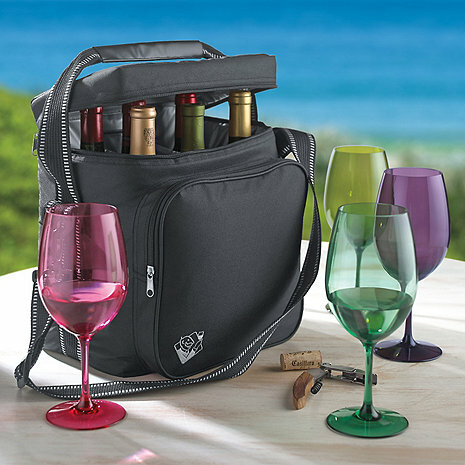 This is a great bag for transporting cold wine to a party, picnic, or for day camping. The bag is well padded to protect your bottles. It insulates fairly well. It is also fairly comfortable to carry, even with the weight of 6 bottles. Excellent product, highly recommended. Bought it to transport wine to social events. Does the job well. Not too bulky, not too rigid, perfectly sized. Great bag-I use it all the time. Its my second one the first one lasted about 5 years. The bag is well-made, versatile, and sturdy! It will be a companion on future outings! Perfect for taking wine everywhere - because that's what we do! Took this wine bag on our cruise back in November 2008 with 3 bottles of wine and 3 bottle of champagne.....It was so nice to have our own choice of wines onboard ship and not to pay for the over priced wines they offer on the cruise. Superb Product!!!! Although I've only used this carrier three times so far, it has become indispensable. I feel secure filling it fully with wines and the wide strap protects my shoulder from the weight. The individual compartments protect the bottles and it seems very durable. I would highly recommend this carrier. Perfect for taking when wine tasting! We currently own six of these, and I'm back to buy more (both for us and for gifts). These bags are great to take along when going wine tasting, to transport the inevitable bottles of wine that will be purchased, as well as the wine club "shipments" that we pick up at the wineries. No more fretting over whether there's shade to park, or if the wine is getting too warm in the car/trunk. They're also very convenient when taking wine to a party or to a friend's/relative's house for dinner (not to mention when we bring our own wine to restaurants). I highly recommend these Weekend Wine Bags! Great value. It's light weight and easy to use. Although the bag holds up to 6 bottles the hand and shoulder straps are very strong so there's no fear of carrying the bottles for any length of time. Good looking very nice design. Keeps bottles cold safe & secure. I bought this wine tote (actually, I bought two because they were on sale) to replace one exactly like it that we have had for several years. It's great for longer weekends when you're taking several bottles or shorter getaways when you only need a couple of bottles and some picnic items. The only issue we had with the previous tote was the seam around the top-inside came apart about a quarter of the way around. It still worked OK but it bothered me enough to replace it. Great. Packed well and folded to go in the suitcase when done. Wine traveled well in a horse trailer under crowded conditions. Just what we were looking for! The dividers are roomy enough for champagne and wine. Works fine for those weekend golf trips with another couple. I just purchased my 2nd Weekend Wine Bag. I love this bag. I had my first one for several years and I finally just wore it out. I take this bag everywhere I travel by car. the dividers inside can be adjusted.. I would recommend to everyone who likes to take their favorite beverages with them when they travel. my favorite is wine of course. It works very well, is quite practical and well priced. It,works well. It replaces an older model that is finally wearing out after years of use. Hope it lasts as long. Nice Item, but needs six ice packs to go along with it, one for each of the six compartments......then it would be perfect!! Use the wine bag to carry wine samples to tasting appointments. Great to take on vacation when traveling by auto. Liquor stores are not always available so we always take a few bottles of wine with us. Also bought one for my niece's husband for Xmas and they take theirs with them on the sailboat. Great! Great for a 6pack weekend in the country. use product to transport wine to new clients. Many such traveling bags are bulky or gaudy; not this one. Its simple, understated design works well; no awkwardness, no fluff. Clean look, could pass for professional. Wish it were a little better priced considering the materials, I'd probably grab a few more for me & as gifts if it were. Great gift for a wine lover! I really wanted to embroider a name of a vineyard on the front pocket but only 3 initials was the option. I was able to find a local vendor to embroider the bag. Love this bag, holds six bottles, the little ice pack fits in well. Love the outside pouch to put other items you may want for a wine day. I have only used it once, but it worked good. the ice pack they provide is pretty useless...doesnt do a good job of keeping things cold. I bought this bag to carry 6 Prosecco bottles to my tastings. It really is a tight squeeze for Prosecco and champagne bottles. With 6 bottles in the bag it leaves no room for the ice cooler. the fit is very snug and it does put a lot of stress on the zipper. It really is designed for slimmer wine bottles. reasonably good protection and easy to carry. the cold pack is not very effective in keeping whites chilled. The weekend wine bag is fine if you have short, Cabernet, Syrah or similar length bottles. If you have anything longer, which seems to be common in my collection, you cannot close the top. Overall, the bag seems well made. The dividers work nicely. The outer compartment is big enough for corkscrews, glass tops (outdoor use), etc. The handle and carrying strap are sturdy. I expected it to be a little better quality. I wouldn't buy another one. This is not for heavy duty use. Also was told I could pack wine glasses because slots went to bottom but not true if came in contact with wine btls. The bottom is open so stems would break. This is really a [$] product. i guess you get what you pay for.